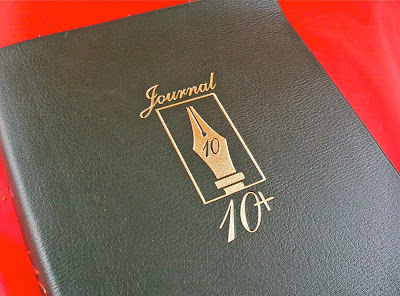 One of my favorite presents of all time is my 10-year journal. Sonny Boy got it for me four years ago. Every night I enter four fascinatin' lines about my day. 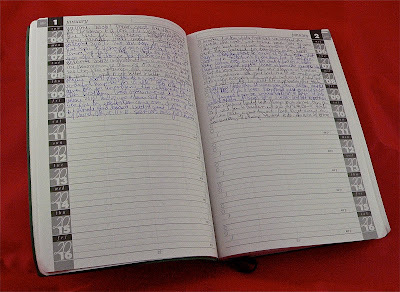 The journal started in 2006 and ends in 2016. It is so much fun to look back and see what I was doing four years ago, three years ago...well, you get the idea. When kids came along, the journal entries got much shorter and more infrequent and yet they reveal that wonderful, dizzying, time as well. At this point in my life, this journal is perfect for me. I like summing up my days in four lines. If I have some deep thinking to do, I grab a notebook and work it out there, but most nights, I grab my trusty green diary and write about my day. Occasionally, I look back at the past entries for the same day in years past and I always look ahead at all the wonderful, promising, clean, wide-open, full-of-possibilities blank spaces for the years ahead. What a fantastic idea to just write 4 lines! That totally takes the pressure off AND allows you to document! This is touching and thought provoking Betty. I keep a journal that usually lists my "good things" of the day, it always has something with my children on there. It helps me see the sunshine in my life when the clouds seem to be taking over. Thanks :) That sweet Sonny boy. This post resonated with me in that I used to be an avid journal keeper, writing long and involved posts, too. I would also re-read old entries and cringe sometimes. :) I do like this 4-lines a day idea; it makes it more manageable. Thank you for sharing! 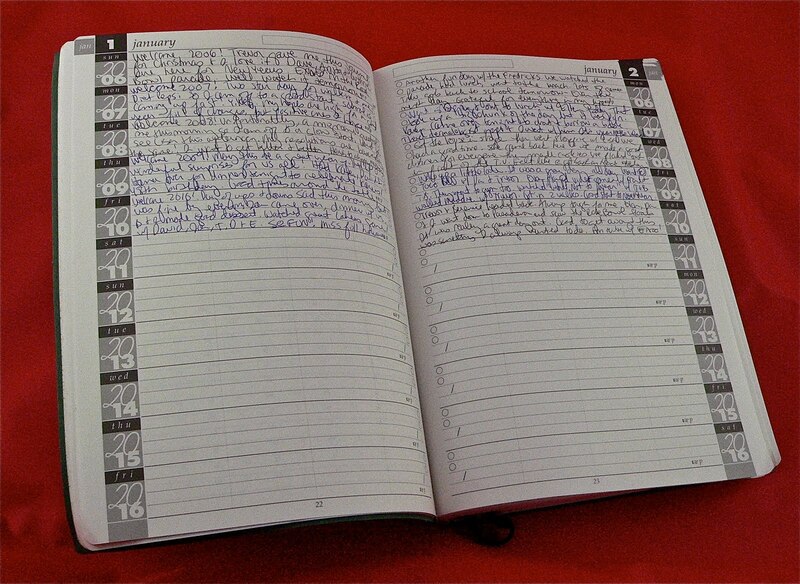 Journals are awesome, but I never kept up on any of them. I admire those that can stick to it. okay this I LOVE! What a fabulous way to chronicle ten years! I've got journals, too! Actually, they are more like calendars, with a few lines for each day. I wouldn't be able to remember anything without them. That really is a cool book. I write on my wall calendar and have been for many years. It is nice because I can give a quick summary of the day and it isn't so daunting! THen on New Year's Eve we read what we have done all year! That's a pretty awesome idea. I tried to keep a journal for awhile but I just couldn't stick with it. You know, this is a tremendous idea! I've bought journals in the past, and have always petered out because all those blank pages was so daunting! But I think even I could handle four lines!! I also love the idea of looking back a year and seeing what was going on then. Thanks for the inspiration! Wonderful idea to look back on those special days. Good days as well as challenging ones. You don't have to write down everything but parts of days. I applaud you. It is a brave idea. What a fantastic idea! I wish I knew about this sooner but am so thankful to find out about it now. I used to journal a lot and, like you, would write so much detail about what was going and while that was good for me at the time, I don't have that same amount of time now to just write. 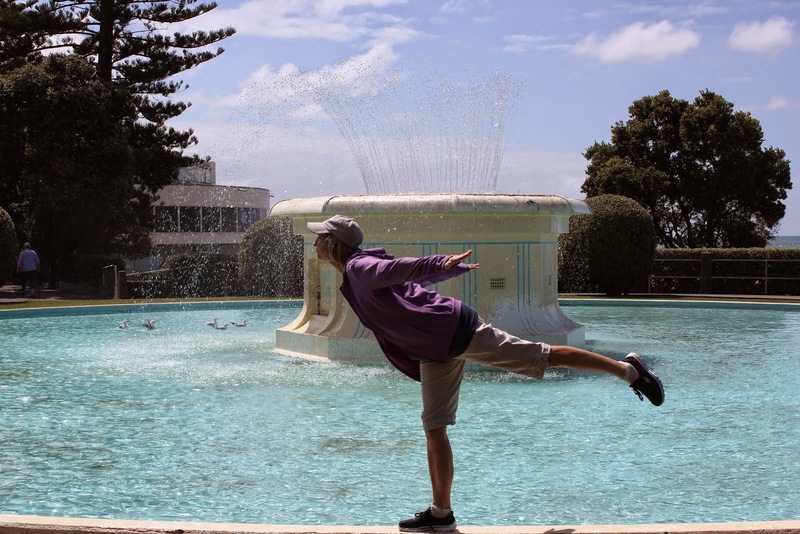 I started my blog so I could spend some time writing. Now I need to find me one of those! how lovely! Where can i get one? You know, I kept a 'diary' when I was a kid, and I wrote in it religiously every day between the ages of about 12 and 15. And they are all lost! I haven't seen them or been able to find them since before we moved the last time 14 years ago, so they really are gone gone. That is one reason why I often blog about life experiences now, past and present. I don't want to lose any of my memories. I love my journals. Just the other day I was showing my girls my diary from my 10 year old heart. Such a wonderful keepsake, to remember what your thoughts were at any given time in your life. I like the idea of a 10 year journal. I've been a not quite reliable journaler since college, but I don't write something every day and some entries go on for several pages and others are just a quick sentence or two. The four line things sounds very reasonable. whatever it is, I'm pretty sure I want one! I've discovered that reading my favorite blogs and commenting has replaced my urge to facebook. THANK YOU BOSSY!!!! Wonderful! I too have a stack of journals from various eras of my life. It's true some are painful to read, but others bring back details about things that would have otherwise been long forgotten and irretrievably gone.